Running 2 trains on the same track at the same time? I was watching the video of David’s PW trains running and noticed he was running 2 trains on the same track at the same time. "Nice video and layout by the way." I tried this with 2 PW 1957 202 ALCOs but one outruns the other. What is the trick to make them run at the same rate? I thought the Lionel motors were made to pull at the same rate. I run two 218s in a ABBA configuration. Are they fighting each other and I don’t know it. What about engines with two motors? Thanks in advance for your answers and help. Its funny that this question should pop up today. I too watched Dav'e video, and only this morning when I logged on had the same question. Great question. The other question I was think about is how he is powering the three loops. I see 2 LW transformers, and that is good for 2 loops, and how about the third. Also, are the LWs adequate for 2 trains? I have used LWs many times, but as the load grows, I can smeel the heat in the air. Great video's and layout Dave. You could try slowing down the 'fast' locomotive by having it pull more cars or heavier cars. I've seen 'matched' pairs of motors advertised on e-bay. I don't know exactly what that means, but there might be something to that idea. Some of the aftermarket TMCC conversion electronics talk about matching motors in a dual morot locomotive too. Thanks for the compliments. You can control the speed of 2 trains somewhat by changing how many and what type of cars are being used. The faster train should have more cars or heavier cars than the slower train. Here is the basic circuit idea that I use to operate 2 trains on one track. This circuit will automatically stop the faster train if it approaches to close to the slower one. The trolley is on a 3rd loop and is powered by a basic Lionel 1025 Transformer. Each loop has its own LW transformer and I have had no problems running 2 trains and some accessories. I have had no transformer overheating problems even when I run the trains for over an hour. Each engine uses about 2 amps each and the accessory lights use another 2 amps or so for a total of about 6 amps per LW transformer. Here is the basic circuit idea that I use to operate 2 trains on one track. This circuit will automatically stop the faster train if it approaches to close to the slower one. If you would like to view my video with 2 mainline loops with 4 trains running, here it is again. This sounds like fun to try out. Doug Murphy 'We few, we happy few, we band of brothers...' Henry V.
What book did you get this information out of? looks like there is good information in it. I have the Greenberg's 1945-1969 operation and repair book but do not see it in there. I did try the extra cars and it helped but I am still wondering what I am doing to my two 218s when i am running them hooked up. Guess I will run then unhooked to see how far apart they are in running speed. The info is in Lionel Train and Accassory Manual (blue) and the Lionel train book (black) both are on ebay occasionally. I haven't looked at Amazon. I also want to do this in the future. I hear the best place for AC relays is Scott's Odd's n Ends. Dennis San Fernando Valley CA. Can this be done with a 6-14111 Lionel 153IR Controller ? Yes, the Lionel 153IR Controller will work even better than the Lionel 153C Controller. 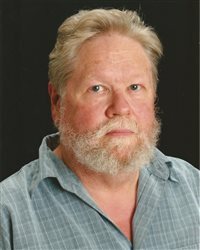 Use the ALL GND and NC connections. Please forgive me but I have no clue what the GND and NC connections.are. Re: Trolly; I want to add one to my layout. Can you te3ll me what I do to get an auto stop at one end and a reverse back to point ? Is it bhardware or wiring, or is it in those bumpers? How would I wire the Lionel 153 IR Controller? I read the previous posts but I'm not sure how to wire the whole operation. Any help would be appreciated. Thank you. Dave I don't have one yet. That is why I asked because I wanted to know what would be a better pick the 153IR or the 153. Check out www.Dallee.com and go to the wiring diagrams. 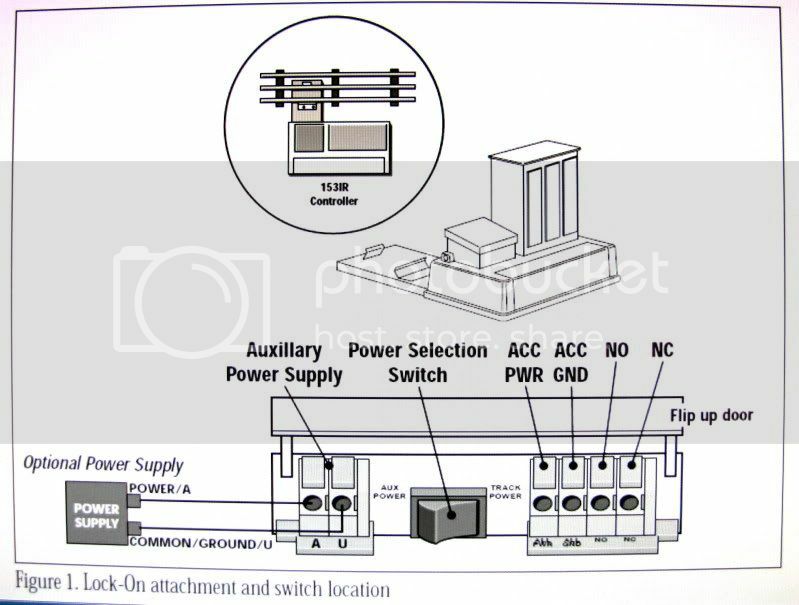 There are 72 pages of electronic diagrams that you get really fancy convention operation. I plan to install a single loop, with one passing siding. There will be three trains running automatically, stopping and going, and throwing the switches automatically. Sounds like fun. 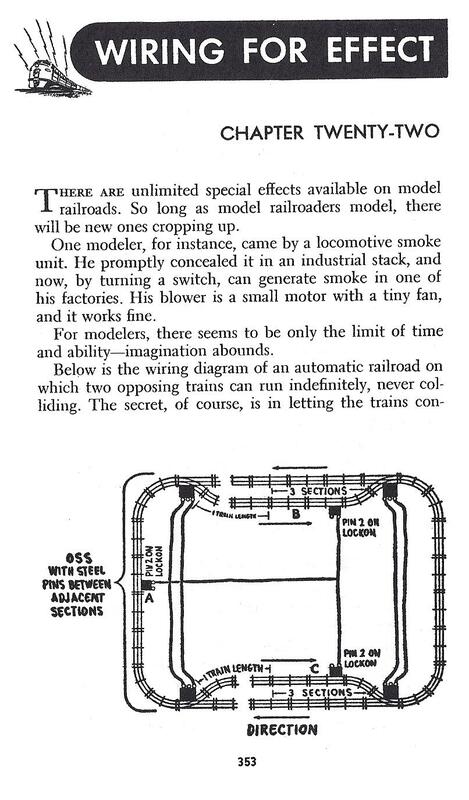 Here's an old trick for running completely separated trains. The loop is broken electrically into blocks with fiber pins. What happens, the faster train starts to catch up, but when it gets too close, it hits a contactor and stops the power on that block. The power starts again once the slower train passes a pre-defined area running over another contactor flipping the power on again. Things to watch out for....length of the trains, good contact, distance between contactors, weight of cars on the contactor and both engines need put into the forward only position for this to work. There has been articles of using relays instead of contactors, which does work more reliably. 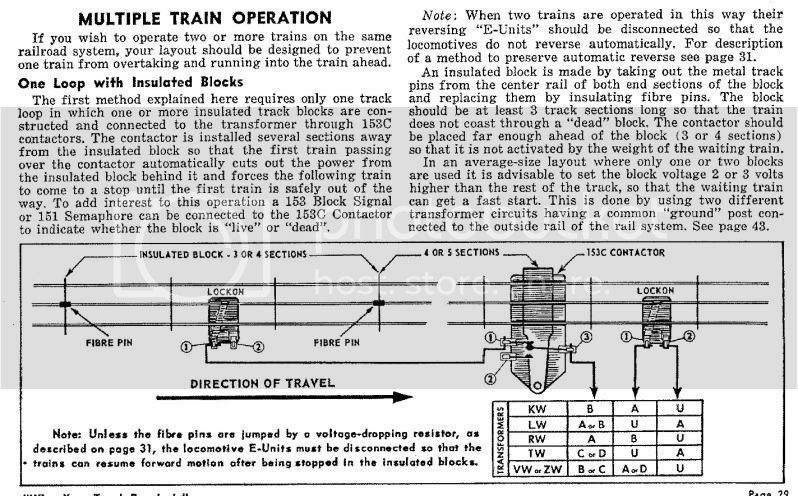 You can do the same thing with a cross over (figure 8), but make sure the cross over has separated power on each opposing rail to keep your block power separated. This looks really neat, the faster engine stops and waits for the slower one to pass by first. Get's the attention of kids big time. Check out the Greenberg layout wiring books, they have a ton of nifty information. (10 ohms, 115 watts). You can also use a rheostat, which is probably what you're thinking about when you write "potentiometer"; but a true potentiometer circuit will waste a lot of power. In any case, an adjustable resistor will take a lot less space than a rheostat or potentiometer. I almost hate to suggest this, but maybe it's time to consider command/control, you can run multiple trains on one block, and you can also do so from a hand-held controller. CTT Dec 04 has a good article by Ray L Plummer on multiple trains on the same track. It also tells of AC relays from Scotts Odds n ends and DC relays and bridge rectifiers from Radio Shack. I have been reading old Atlas N and HO track planning books by John Armstrong and Thaddeus Stepek. These are some of the best books ever written on model railroading, I literally study them over the years. N and HO guys often have several long passing sidings and they run two trains by pulling into a siding when needed. O requires a whole house basement size layout to do this easily and I see pictures on the forums where a few people have this much room. I suspect if you have this much room your well off enough that you have sold all your pre 96 engines and have all command control. I have my layout wired for dual cab control. Thats where in a block when the toggle switch is to the left the left transformer controls that train and to the right the right transformer controls another train. 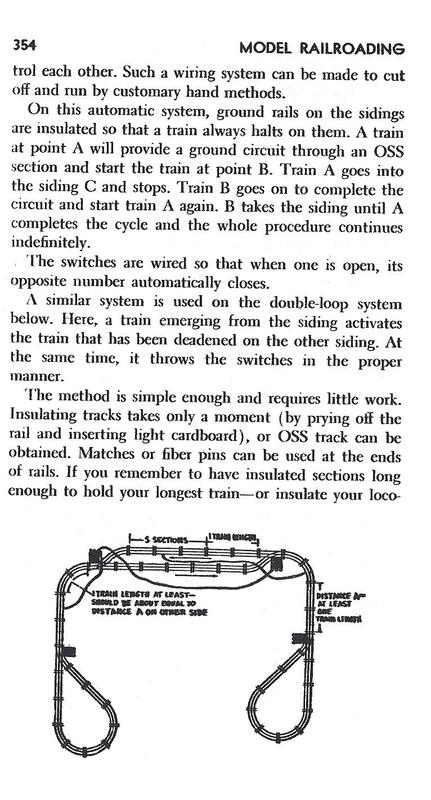 CTT May 99 article by Mark Horne is the best on how to wire 3 rail for this. N and HO guys stop a train in a block to allow the train ahead to get ahead. I havent had my layout operational very long but my dual cab is mostly to stop a train here while another train makes a switching maneuver. I never have tried to run two trains by stopping one train in one block to get the 1st train to pull ahead, I guess I could with a engine that runs well at slow speed. My layout isen't that big, the idea of frantically flipping toggles dosen't appeal but I will try it sometime. Wow I can’t believe all of the feedback on this question and all of the good suggestions. Anyway I just got a very nice 153 block signal and a 153C controller on E-bay for under $29.00 with shipping and plan to see how it will work. The layout is still in the development stage so I can try it in different spots around the loop. Have been working a lot and have not had much time to go downstairs but hope to get it set up in the next week and will let you all know how it works out. I am trying to keep my layout as much post war as I can seeing that is what I already have. Of my 16 locos and engines only 3 are newer than 1969 one is a 1971 one is 1983 and the newest is 1990. The 1971 and 1983 are the ones I let the grandkids use. Thanks for all of the ideas. I use a 153C to run two trains on a loop on my Christmas tree layout. The 153C will work great if you follow the directions (sounds obvious, but worth repeating) and don't secure the track sections too tightly on either side of the 153C. Also, be sure the 153C's spring and thumb screw adjustment move freely. (Use a drop or two of lightweight oil, if needed.) You'll probably need to fine-tune the setting once your trains are running on the loop. I just joined the forum. I was looking to run two trains on one track and came upon this post a couple of days ago. I set up the block as illustrated and have struggled since. I puchased several 153 c connectors and they seem problematic, they work for awhile and then fail. Are they possibly over-heating if run too long? Some work and some don't, the new ones aren't any better than the used. I might get ten times around the circle before it fails. Should I use loctite on the 153 to help keep it in adjustment? Gary, Welcome to the forum. Most likely the problem with the 153Cs are the weight of the cars. Newer cars are too light to press them down enough to make them work in some cases. Old post war cars were heavy and would keep the 153 in position. I don’t think they overheat. That brings Gomez Adams to mind! He was into trains when there were no forums.